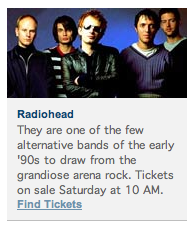 After last year’s ridiculous story about Ticketmaster selling tickets to a Radiohead show at Bally’s in Las Vegas, we get wind of news that ticketmaster.com saying that tickets for Radiohead will be going on sale tomorrow morning at 10 AM. We’re pretty sure this is a mistake folks. If you want to see the goof, you have to select “Philadelphia” as your location and look to the bottom right of the page. UPDATE Saturday 7:42 AM PT: Ticketmaster took down the mistake.